This would be a perfect summer snack with its combination of water filled zucchini and parsley with the flavours of lemon, chillies and walnuts. 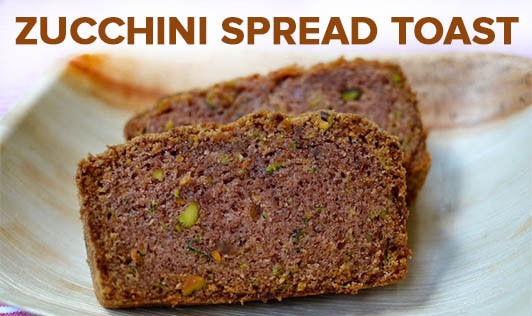 Spreads make simple breads and toast exotic! 1. Squeeze out excess water from the zucchini.Combine all the ingredients, except walnuts, and blend in a mixer to a smooth paste. 2. Transfer the paste to a bowl, add walnuts and mix well. 3. Cover and refrigerate for at least an hour. 4. Divide the spread into 8 equal portions and keep aside. 1. Just before serving, toast the bread slices in a sandwich griller or a non-stick pan till they are brown and crispy on both the sides. 2. Apply a portion of the spread evenly over each bread slice.